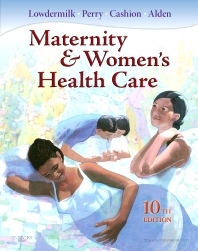 With comprehensive coverage of maternal, newborn, and women's health nursing, Maternity & Women's Health Care, 10th Edition provides evidence-based coverage of everything you need to know about caring for women of childbearing age. It's the #1 maternity book in the market -- and now respected authors Dr. Deitra Leonard Lowdermilk, Dr, Shannon E. Perry, Kitty Cashion, and Kathryn R. Alden have improved readability and provided a more focused approach! Not only does this text emphasize childbearing issues and concerns, including care of the newborn, it addresses wellness promotion and management of common women's health problems. In describing the continuum of care, it integrates the importance of understanding family, culture, and community-based care. New to this edition is the most current information on care of the late preterm infant and the 2008 updated fetal monitoring standards from the National Institute of Child Health and Human Development. A logical organization builds understanding by presenting wellness content first, then complications. Critical Reasoning exercises offer real-life situations in which you can develop analytical skills and apply their knowledge. Medication Guide boxes provide an important reference for common drugs and their interactions. Cultural Considerations boxes stress the importance of considering the beliefs and health practices of patients from various cultures when providing care. Family content emphasizes the importance of including family in the continuum of care. Nursing Care Plans include specific guidelines and rationales for interventions for delivering effective nursing care. Community Activity exercises introduce activities and nursing care in a variety of local settings. Student resources on the companion Evolve website include assessment and childbirth videos, animations, case studies, critical thinking exercises with answers, nursing skills, anatomy reviews, a care plan constructor, review questions, an audio glossary, and more. 3. Clinical Genetics NEW FOCUS!